The Battle of Hürtgen Forest (German: Schlacht im Hürtgenwald) was a series of fierce battles fought from 19 September to 16 December 1944 between American and German forces on the Western Front during World War II in the Hürtgen Forest, a 140 km2 (54 sq mi) area about 5 km (3.1 mi) east of the Belgian–German border. It was the longest battle on German ground during World War II, and is the longest single battle the U.S. Army has ever fought. A farmhouse in Hürtgen served as shelter for HQ Company, 121st Infantry Regiment, 8th Infantry Division, XIX Corps, 9th US Army. They nicknamed it the "Hürtgen Hotel". The U.S. commanders' initial goal was to pin down German forces in the area to keep them from reinforcing the front lines farther north in the Battle of Aachen, where the US forces were fighting against the Siegfried Line network of fortified industrial towns and villages speckled with pillboxes, tank traps and minefields. A secondary objective may have been to outflank the front line. The Americans' initial tactical objectives were to take Schmidt and clear Monschau. In a second phase the Allies wanted to advance to the Rur River as part of Operation Queen. The Germans fiercely defended the area because it served as a staging area for the 1944 winter offensive Unternehmen: Wacht am Rhein (later known as the Battle of the Bulge), and because the mountains commanded access to the Rur Dam[notes 2] at the head of the Rur Reservoir (Rurstausee). The Allies failed to capture the area after several heavy setbacks and the Germans successfully held the region until they launched their last-ditch offensive into the Ardennes. This was launched on 16 December which ended the Hürtgen offensive. 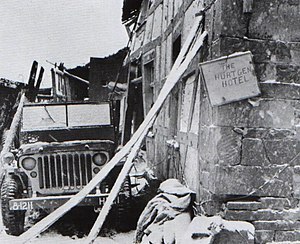 The Battle of the Bulge gained widespread press and public attention, leaving the battle of Hürtgen Forest less well remembered. The overall cost of the Siegfried Line Campaign in American personnel was close to 140,000. By mid-September 1944, the Allied pursuit of the German army after the landings at Normandy was slowing down due to extended supply lines and increasing German resistance. The next strategic objective was to move up to the Rhine River along its entire length and prepare to cross it. Courtney Hodges′ First Army experienced hard resistance pushing through the Aachen Gap and perceived a potential threat from enemy forces using the Hürtgen Forest as a base. The U.S. 1st Infantry Division arrived in early October, joining elements of the XIX Corps and VII Corps, which had encircled Aachen. Although the 1st Infantry Division called for the surrender of the German garrison in the city, German commander Oberst Gerhard Wilck refused to capitulate until 22 October. View to the west over the Kall Valley. The Hürtgen Forest occupies a rugged area between the Rur river and Aachen. The dense conifer forest is broken by few roads, tracks, and firebreaks; vehicular movement is restricted. In the autumn and early winter of 1944, the weather was cold, wet, and cloudy, and often prevented air support. Conditions on the ground became a muddy morass, further impeding vehicular traffic, especially heavy vehicles such as tanks. The German defenders had prepared the area with improvised blockhouses, minefields, barbed wire, and booby-traps, hidden by the mud and snow. There were also numerous concrete bunkers in the area, mostly belonging to the deep defenses of the Siegfried Line, which were also centers of resistance. The dense forest allowed infiltration and flanking attacks, and it was sometimes difficult to establish a front line or to be confident that an area had been cleared of the enemy. The small numbers of routes and clearings in the forest had also allowed German machine gun, mortar, and artillery teams to pre-range their weapons and fire accurately. Apart from the poor weather, the dense forest and rough terrain also prevented proper use of Allied air superiority, which had great difficulties in spotting any targets. The densely forested terrain also limited the use of tanks and provided cover for German anti-tank teams equipped with panzerfaust shaped-charge grenade launchers. Improvised rocket launchers were made, using rocket tubes from aircraft and spare jeep trailers. Later in the battle, it proved necessary to blast tank routes through the forest. Transportation was similarly limited by the lack of routes: At critical times, it proved difficult to reinforce or supply front-line units or to evacuate their dead and wounded. The Germans were hampered by much the same difficulties, worsened because their divisions had already taken heavy losses on the retreat through France and were hastily filled up with untrained boys and old men, often unfit for normal military service. Transportation was also a problem, because of the difficult roads and the lack of trucks and fuel; most supplies had to be manhandled to the front line. Despite increasing numbers of replacements lacking experience, German defenders had the advantage in that their commanders and many of their soldiers had been fighting for years and had learned the necessary tactics for fighting efficiently in winter and forested areas, whereas the Americans were often well-trained but inexperienced. The tall forest canopy also favored the defenders. Artillery fire was fused to detonate as tree bursts or detonated when it impacted the tree tops. This caused hot metal shrapnel and wood fragments to rain down. Since American soldiers had been trained to react to incoming artillery fire by hitting the ground, the technique proved particularly deadly until American GIs learned to "hug a tree" during bombardment. While defenders were protected from shell fragments and wood splinters by their dug-in defensive positions, attackers in the open were much more vulnerable. Conversely, U.S. mortars needed clearings in which to work: these were few and dangerous, being pre-ranged by German troops, so mortar support was often unavailable to rifle platoons. The Hürtgen Forest lay within the area of the U.S. First Army under the command of Lieutenant General Courtney Hodges. Responsibility fluctuated between the V Corps and VII Corps. At the start, the forest was defended by the German 275th and 353rd Infantry Divisions; understrength but well prepared — 5,000 men (1,000 in reserve) — and commanded by Generalleutnant Hans Schmidt. They had little artillery and no tanks. As the battle progressed, German reinforcements were added. American expectations that these troops were weak and ready to withdraw were over optimistic. The 9th Infantry Division's ultimate objective was Roer River crossings at Düren. On September 14, 1944, an attack by the 47th Infantry Regiment captured Schevenhütte, on the northern fringes of the forest, with few casualties. The division had surprised the Germans, but lacked the strength to push on as two of their regiments were committed to the south. Attacks on and around the Höfen-Alzen ridge by the 39th and 60th Infantry Regiments were met with heavy resistance and pushed back. The 1st and 2nd Battalions of the 39th captured Lammersdorf, but could not dislodge enemies entrenched in the woods behind the village; the 3rd Battalion suffered heavy losses attacking Hill 554, near Lammersdorf. In these early engagements, the 9th Infantry Division was unable to eject the Germans from the periphery of the forest, and decided to push through it to the northeast and capture Hürtgen and Kleinhau. The engagement began on September 19, 1944. Repeated probes entered the forest toward their objective, but were beaten back by the terrain and Germans dug into prepared positions. On October 5, the 39th and 60th Infantry Regiments attacked towards the town of Schmidt while the 47th held a defensive position. The Monschau-Düren road was quickly cut, but both regiments were slowed by defenses and suffered significant casualties: The 60th's 2nd Battalion was reduced to a third after the first day. The 39th was halted at the Weisser Weh Creek; there were problems with narrow paths, air bursts in trees, and fire breaks which were blocked or enfiladed. Evacuation and supply was difficult or impossible. By 16 October, 3,000 yd (2,700 m) had been gained at the cost of 4,500 casualties. The U.S. 28th Infantry Division — a Pennsylvania National Guard unit arrived on 16 October, to relieve the battered 9th. The 28th Division was reinforced with the attached 707th Tank Battalion, tracked M29 Weasel transport and air support. Of its three regiments, one was deployed to protect the northern flank, another to attack Germeter, and the third to capture Schmidt, the main objective. The area had terrible terrain with the Kall Trail running along a deep river ravine. The terrain was not suited to tanks, despite the need for armor to support the infantry. The attack by the 28th Division started on 2 November; the defenders were expecting it and were ready. The U.S. 109th Infantry Regiment, assigned to capture the woods north of Germeter, was impeded after 300 yards by an unexpected minefield (the "Wild Pig"), pinned down by mortar and artillery fire and harassed by local counterattacks. Just one mile was gained after two days, after which the 109th dug in and endured casualties. This initial attack was nearly all the ground the 109th would take during the battle. The U.S. 110th Infantry Regiment had to clear the woods next to the Kall River, capture Simonskall, and maintain a supply route for the advance on Schmidt: Again, these were very difficult tasks due to weather, prepared defenses, determined defenders, and terrain. The weather prevented tactical air support until 5 November. The U.S. 112th Infantry Regiment, attacking from Germeter, took Vossenack and the neighboring ridge by the afternoon. The 112th was then halted by strong defenses and difficult terrain. The 1st and 3rd Battalions of the 112th moved across the Kall Valley and captured Kommerscheidt and Schmidt, respectively, on 3 November. The German supply route to Monschau was cut, but American supply, reinforcement, and evacuation were very limited as the Kall Trail had poor terrain and was infiltrated by the Germans. At dawn on November 4, a strong German counter-attack by tanks of the 116th Panzer Division and a chance encirclement by troops from the 89th Infantry Division rapidly expelled the 3rd Battalion from Schmidt, and they were unable to counter-attack. The battalion disintegrated after constant shelling and a fierce attack by the 116th Panzer Division and some men inadvertently fled east, to be captured by the Germans. The rest of the battalion retreated to Kommerscheidt to join the 112th's 1st Battalion. Realizing the gravity of the situation, eight M4 Shermans of Company A, 707th Tank Destroyer Battalion attempted to cross the Kall Valley, but only three actually made it across to support the beleaguered 112th. The 116th Panzer Division again attacked with tanks and infantry several times. The American tanks, along with infantry and air support, destroyed five German Panzer IV tanks. At Vossenack, the 112th's 2nd Battalion was nearly forced out of the town on November 6 by a fierce German counterattack, but were assisted by engineers in retaking the western part of the town. The Americans across the Kall Valley at Kommerscheidt held on until November 8, when an order to withdraw was given. The positions at Schmidt and the Kall Trail were abandoned. It wasn't until February 1945 that the 82nd Airborne Division permanently captured the Kall Trail and Schmidt. A German regimental doctor, Hauptmann Günter Stüttgen, negotiated an unofficial ceasefire with the Americans at the Kall Bridge from 7–12 November, in order to attend to the wounded of both sides, numbering in the thousands. The lives of many American soldiers were saved by German medics. The second phase was part of Operation Queen, the Allied thrust to the Rur River. In this phase, the U.S. 4th Infantry Division was to clear the northern half of the forest between Schevenhütte and Hürtgen, capture Hürtgen, and advance to the Rur south of Düren. From 10 November, this would be VII Corps′ responsibility and it was part of the main VII Corps effort to reach the Rur. The 4th Division was now fully committed to the Hürtgen, although its 12th Infantry Regiment was already mauled from its action at Schmidt, leaving just two fully effective regiments to achieve the divisional objectives. U.S. VII Corps was opposed by German forces, mainly from the LXXXI Corps, consisting of three understrength divisions. In the Hürtgen, there was the 275th Infantry Division — 6,500 men with 150 artillery pieces. They were well dug-in and prepared. The VII (U.S.) Corps, First Army attacked 16 November 1944, with 1st Inf Div, 4th Inf Div, 104th Inf Div, and CCR 5th AD to clear Huertgen Forest and the path of First Army to the Rur River. After heavy fighting, primarily by the 4th Infantry Division, VII Corps' attack ground to a halt. V Corps was committed on 21 November 1944. Attacking with 8th Inf Div, and CCR 5th AD, the V Corps managed to capture Huertgen after stiff fighting on 28 November 1944. The attack started on 16 November. The two infantry regiments attacked in parallel columns: the 8th along the northern edge of the forest towards Düren, the 22nd further south in parallel. The open flanks invited infiltration. Similar tactics elsewhere in Hürtgen had "invited disaster". Attacks by the 8th Infantry Regiment on Rother Weh Creek hit heavy resistance and were repulsed with heavy losses. The 22nd failed to take Raven's Hedge (Rabenheck), beaten back by heavy machine-gun and artillery fire along the fire-breaks. After three days, there were 300 losses, including numerous officers and NCOs. 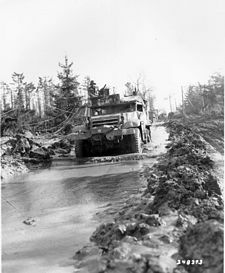 By 18 November, tanks were deemed essential, so engineers blasted tank routes through the forest. Communications and logistics remained a problem, so the next day the attack paused to allow re-supply and evacuation of the wounded. German reinforcements arrived from 344th and 353rd Infantry Divisions and resistance stiffened further. Responsibility was returned to V Corps and, on 21 November, 8th Division attacked the Weisser Weh Valley, continuing toward Hürtgen. The 121st Infantry Regiment hit heavy defenses immediately. Despite armored support from the 10th Tank Battalion, daily advances were less than 600 yd (550 m). Hürtgen was taken on 29 November and the battle continued to Kleinhau, 1 mi (1.6 km) north. Commemorative plaque at a house in Merode remembering the soldiers of the 1st Infantry Division lost in action at the Merode area 1944. The final action in the Hürtgen Forest was at Langerwehe-Merode, on the northeastern edge of the forest. Two American companies took the village, but they were later destroyed in a German counter-attack. 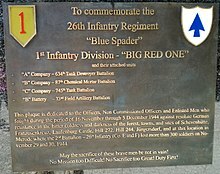 More than 300 soldiers of the 1st Infantry Division were lost in action on November 29 and 30, 1944. Later, the secret daily report of the Supreme High Command of the German Army (Oberkommando des Heeres (OKH)) of 27 November, stated that in the old Langerwehe penetration area, the U.S. Army (enemy) won terrain. Elements of the 8th and the 28th Infantry Divisions then advanced on Brandenberg. The 28th Division — just like the 9th before it (and the 4th Infantry Division, which would relieve the 28th) — also took heavy casualties during its stay in the Hürtgen Forest. On 14 November, the 2nd Ranger Battalion arrived to relieve elements of the 112th Infantry Regiment. On 6 December, the Rangers moved on Bergstein and subsequently took the strategic position of Hill 400 from defending troops from 980th Grenadier Regiment of the 272nd Volksgrenadier Division. Shortly thereafter, on 12 December, the towns of Gey and Strass were taken by American Forces. On the last day of the Hurtgen battle the Germans retook the hill from the 13th Regiment who had replaced the Rangers. The U.S. Army would not seize Hill 400 again until February 1945. From 1-12 December, the 309th, 310th and 311th Infantry Regiments of the 78th Infantry Division ("Lightning") relieved elements of the 1st Infantry Division in the line in the vicinity of Entenpfuhl. On 13 December, these regiments smashed into Simmerath, Witzerath, and Bikerath, Germany, and were fighting the Battle of Kesternich against the 272nd Volksgrenadier Division when General Gerd von Rundstedt launched his counteroffensive in the Monschau area on 18 December. The 78th Infantry Division held the area of the Siegfried Line they had seized against German Attacks throughout the winter during the Battle of the Bulge. On 16 December 1944, German forces began the Ardennes Offensive, more commonly known as the Battle of the Bulge and as a result further fighting in the Hurtgen ended. The battle of the Hurtgen ended in a German defensive victory and the whole offensive was a dismal failure for the Allies. The Americans suffered 33,000 casualties during the course of the battle which ranged up to 55,000 casualties, included 9,000 non-combat losses and represented a 25 percent casualty rate. The Germans had also suffered heavy losses with 28,000 casualties — many of these were non combat and prisoners of war. The surprise German Ardennes offensive caught Allied forces off guard. The Germans attacked with nearly 30 divisions; including the 1st SS, 2nd SS, and the 12th SS Panzer Divisions, with the northernmost point of the battlefront centered on Monschau. They forced a large salient in the American lines almost sixty miles deep at its maximum extent. However, the Germans never came close to their primary objective, the capture of Antwerp. The Ardennes Offensive came to a complete halt in early January, when German forces in the northern shoulder of the bulge were blocked by a strong American defence, the destruction of bridges by American engineers, and a lack of fuel. In early February, American forces attacked through the Hürtgen Forest for the final time. On 10 February 1945, the Rur Dam was taken by American forces and the Forest itself was not cleared until the 17th when the 82nd Airborne Division reached the Roer River. There is a stone monument, with a bronze plaque, at the Hürtgen Military Cemetery, dedicated by veterans of the U.S. 4th Infantry Division to the memory of Friedrich Lengfeld (29 September 1921 – 12 November 1944), a German lieutenant. Lengfeld died on 12 November 1944, of severe wounds sustained while helping a wounded American soldier out of the "Wild Sow" ("Wilde Sau") minefield. 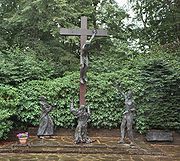 It is the only such memorial for a German soldier placed by his erstwhile opponents in a German military cemetery. I didn't want to create a monument to heroes, no theatrical representation, no pathos, but wanted to appear more unassumingly with a frugal shape, hewn in stone, dignifying the actual place of the incident. A place perhaps, at which once everything may have started rationally, then however, became more and more irrational and totally out of control until a return to sanity—or was it still emotion?—made a humanitarian encounter come true. The 1944 Hürtgen Forest Museum was opened on 29 March 1983 in Kleinhau in a stone barn to commemorate the battle. A marker in a Germany Military Cemetery honouring German Lieutenant Lengfeld who gave his life trying to save a US Soldier. The sculpture on the Kall Bridge. Historical discussion revolves around whether the American battle plan made any operational or tactical sense. One analysis:240–241 is that the Allies under-estimated the strength and determination remaining in the psyche of the German soldier, believing his fighting spirit to have collapsed under the stress of the Normandy breakout and the reduction of the Falaise Pocket. 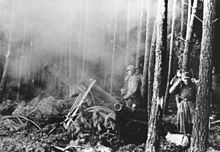 American commanders, in particular, misunderstood the impassability of the dense Hürtgen Forest and its effects of reducing artillery effectiveness and making air support impracticable. The better alternative of breaking through south-east out into the open valley where their advantages in mobility and airpower could come into play and then head northeast towards the actual objectives seems not to have been really considered by the higher headquarters. In addition, American forces were concentrated in the village of Schmidt and neither tried to conquer the strategic Rur Dams nor recognized the importance of Hill 400 until an advanced stage of the battle. ^ The Rur Dam holds back the Rurstausee and is the major structure in a network. Upstream are other, smaller, structures: the Paulushof Dam holding the Obersee and the Urft Dam holding the Urfttalsperre. If the floodgates were opened, the resulting surge would flood low-lying areas downstream and temporarily prevent forces from crossing the river. ^ Whiting, Battle of Hurtgen Forest, pp.xi-xiv, 271–274. ^ a b c MacDonald, Charles B. Siegfried Line Campaign Center of Military History, United States Army, 1984. ^ a b c Neillands, Robin (2005). The Battle for the Rhine 1945. London: Orion Publishing Group. ISBN 0-297-84617-5. ^ "CSI Battlebook" (PDF). dtic.mil/. 1984. Retrieved 2007-02-03. ^ Marino, James (October 3, 2016). "Taking Hill 400: Army Rangers vs Fallschirmjägers". Warfare History. Retrieved 19 April 2017. ^ Miller, Edward G. (November 1996). "Desperate Hours at Kesternich". World War II Magazine. Retrieved 24 July 2018. ^ Cole, Hugh M. (1965). The Ardennes: Battle of the Bulge (LC, 65-60001 ed.). Washington, D.C.: Department of the Army, Office of the Chief of Military History. p. 651. ^ Richard Atkinson (2013). The Guns at Last Light. pp. 320–324. Atkinson, Rick (2013). The Guns at Last Light (1 ed.). New York: Henry Holt and Company. ISBN 978-0-8050-6290-8. Bergstrom, Christer (2014). The Ardennes, 1944-1945 Hitler's Winter Offensive. Casemate / Vaktel Forlag. ISBN 9781612002774. Currey, Cecil B. (1984). FOLLOW ME AND DIE: The Destruction of an American Division in World War II. New York: Stein & Day. Nash, Douglas (2008). Victory was Beyond Their Grasp: With the 272nd Volks-Grenadier Division from the Hürtgen Forest to the Heart of the Reich. Bedford: The Aberjona Press. Regan, G. More Military Blunders. Carlton Books, 1993. Zabecki, David T, ed. (2015). World War II in Europe: An Encyclopedia Military History of the United States. Routledge. ISBN 9781135812492. Zaloga, Steven J (2007). Siegfried Line 1944–45: Battles on the German frontier. Osprey Publishing Ltd. ISBN 1-84603-121-4. Wikimedia Commons has media related to Battle of Hürtgen Forest.